Welcome back to a Wonderland that is as astonishingly new as it is joyously familiar. Helen Oxenbury, one of the world’s most acclaimed illustrators, brings her special brand of magic to the Lewis Carroll classic in a handsome volume boasting more illustrations than any other edition - called a "masterpiece" by Parents’ Choice. Her Wonderland is exuberant, contemporary, and lovingly created, with all the warmth, depth of emotion, humor, and acute observations of people and animals for which the artist’s work is so highly regarded. An elegant, textured cover with flaps makes this a beautiful gift book. LEWIS CARROLL (1832-1898) was the pen name of Charles Lutwidge Dodgson, as English author and mathematician. His masterpiece, ALICE'S ADVENTURES IN WONDERLAND, had modest origins: it was hand written and illustrated as a Christmas gift for a child friend, Lice Liddell. Three years later it was published as ALICE'S ADVENUTRES IN WONDERLAND under the pseudonym Lewis Carroll—to immediate and rousing success. It has since become one of the most beloved and well-known classics of all time. 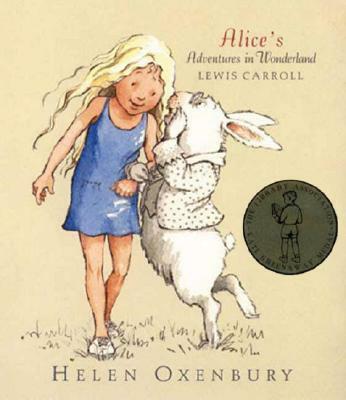 Helen Oxenbury says that she enjoyed ALICE'S ADVENTURES IN WONDERLAND when her mother read it to her as a child. The text still makes her laugh; even now she'll come across a passage of the book and think what wonderful nonsense it is. For today's children, she has made Alice a modern child, but otherwise, she says, it's just her view. Helen Oxenbury has won the Kate Greenaway Medal twice, as well as many other prestigious awards. "The volume is oversized, the typeface large and friendly, the margins generous. This beautiful book quietly takes Alice out of the inky hands of scholars and places her back in the hands of children, where she has always belonged."